Corporate insolvency in Singapore is primarily governed by the Companies Act, which is supplemented by the Companies (Winding-Up) Rules and the Companies Regulations. Certain provisions of the Bankruptcy Act also apply to corporate insolvency in Singapore and the Bankruptcy Rules are also relevant. Apart from the general corporate insolvency provisions, Singapore has also provided for industry-specific insolvency or winding-up rules for certain industries, including the banking industry. These rules will apply to the relevant industry in addition to the insolvency provisions under general company law. Singapore insolvency law and practice is substantially based on insolvency law and practice in the United Kingdom and Australia. Singapore’s insolvency laws have undergone substantial reformation following the Ministry of Law’s appointment in December 2010 of the Insolvency Law Review Committee (ILRC) to review Singapore’s existing personal bankruptcy and corporate insolvency regime and to provide recommendations in relation to a new omnibus Insolvency Act. In May 2017, the Companies Act was amended to implement significant changes to Singapore’s insolvency regime with the stated objective of attracting more foreign debtors to restructure their debts in Singapore, thereby positioning Singapore as an international centre for debt restructuring. The scope of existing insolvency and pre-insolvency processes have not only been widened and enhanced; familiar features from leading insolvency regimes worldwide, such as the United States Title 11 debtor-in-possession regime, have also been adapted and incorporated. The Companies Act provides for a range of insolvency and reorganisation options for companies in distress, namely: liquidation, judicial management and receivership, as well as schemes of arrangement between companies and their creditors and shareholders. In October 2013, the ILRC issued a report (the ILRC Report), endorsing the enactment of a new Insolvency Act and setting out various recommendations on the provisions of the new Insolvency Act. The recommendations by the ILRC included proposals to enhance the existing insolvency and reorganisation mechanisms as well as the management of cross-border insolvency issues. e the adoption of the UNCITRAL Model Law on Cross-Border Insolvency. The objective of compulsory winding up is to realise a company’s assets and distribute them to creditors in order of priority. Any company can be compulsorily wound up, regardless of whether it is registered in Singapore, provided that it has some connection with Singapore and meets the relevant criteria under the Companies Act. For example, a foreign company may be wound up under the amended Companies Act if the creditor can demonstrate that the company’s centre of main interests is in Singapore or that the company has substantial assets in Singapore. A provisional liquidator will be appointed by the High Court (the Court) pending determination of the winding-up application5 if the applicant can demonstrate a prima facie case for the granting of a winding-up order and the Court is satisfied in the circumstances of the case that a provisional liquidator should be appointed. An interim judicial manager may be appointed by the court pending determination of the judicial management application if: the applicant can demonstrate a prima facie case for the granting of a judicial management order; and the Court is satisfied in the circumstances of the case that an interim judicial manager should be appointed. Judicial management has become less popular as a corporate rescue mechanism in recent years, as creditors are often wary of replacing a company’s management with individuals who are not necessarily as familiar with the business. The Court may order the appointment of a receiver or a receiver and manager in ‘all cases in which it appears to the Court to be just and convenient’.12 The Court has relatively wide discretion to make such appointments and usually does so where there is genuine concern that the company’s assets are in jeopardy and may be dissipated to the detriment of the debenture holders. Often, a secured creditor may also enforce its security rights against the debtor company by appointing a receiver, or a receiver and manager. The receiver’s primary duty is to realise the assets for the benefit of the secured creditors that appointed him or her, or in the case of the receiver and manager, to manage and realise the assets that come within the ambit of his or her appointment. A statutory declaration of the company’s inability to carry on business by reason of its liabilities24 and a statement of affairs pertaining to the company must be filed with the Accounting and Corporate Regulatory Authority (ACRA) within seven days of the appointment of the liquidator.25 Within one month of the date of the statutory declaration, an EGM of the company’s shareholders and a meeting of the company’s creditors must be convened. Voluntary winding up is deemed to have commenced when the resolution for voluntary winding up is passed26 or on the date of the making of the statutory declaration in the situation where a provisional liquidator is appointed. Holders of debentures that contain an express power to appoint a receiver or a receiver and manager can make such an appointment privately. The powers of the receiver or receiver and manager are prescribed by the terms of the debenture. An application to the Court for approval of a scheme of arrangement may be made by the company, any creditor or member of the company or the liquidator of the company (where the company is being wound up).36 The application is made by way of originating summons supported by an affidavit. A scheme of arrangement that has been approved by the Court may only be amended by way of an order of court. A scheme of arrangement approved by the Court will need to be lodged with the ACRA before it becomes binding. The Singapore courts have assigned certain judges with the requisite expertise as docketed insolvency judges to hear insolvency and restructuring related applications, including on an urgent basis. Generally, the various insolvency procedures will be administered by the respective insolvency professionals appointed. However, the Court does retain a certain degree of oversight. Upon the making of a winding-up order by the Court, the liquidator may only carry on the business of the company so far as is necessary for the beneficial winding up of the company for a period of four weeks after the date of the winding-up order. Thereafter, the liquidator can only do so with the leave of the Court or the committee of inspection.45 The powers of the company’s directors also effectively cease when the winding-up order is made by the Court. The Court has the power to supervise scheme meetings and it is open to the scheme manager to apply to the Court for directions and other ancillary orders as may be appropriate. Singapore has enacted additional industry-specific legislative provisions for insolvency. Examples include the resolution regime for a bank licensed under the Banking Act as set out in the Monetary Authority of Singapore Act and the resolution regime for insurance companies as set out in the Insurance Act. The availability of an order for priority for rescue financing depends on the level of priority sought, whether the company has made a scheme application or moratorium application, or both, or whether there is a judicial management order in force. In particular, in order for the rescue financier to be granted the priority levels as per (2) to (4) above, it must be shown that the company is unable to obtain the rescue financing from other persons unless the rescue financier is accorded that particular level of priority. Further, in order for an existing secured interest to be overridden (i.e., level (4) above), the Court must be satisfied that the existing secured creditor is ‘adequately protected’. c promoting cooperation and coordination between courts of different jurisdictions and insolvency administrators. Together with the abolition of the ring-fencing rule in respect of foreign companies under Part XI, the introduction of the Model Law is a marked departure from the traditionally territorial conception of cross-border insolvency and is emblematic of the shift towards the principle of modified universalism that was embraced by the Court in Re Opti-Medix Ltd (in liquidation) and another matter  SGHC 108 as the golden thread running through cross-border insolvency law, which requires courts to, as far as is consistent with justice and public policy, cooperate with the courts in the country of the principal liquidation to ensure that all the company’s assets are distributed to its creditors under a single system of distribution. The adoption of the Model Law also provides clarity in respect of the recognition of foreign insolvency proceedings and coheres neatly with pre-Model Law decisions such as Re Taisoo Suk (as foreign representative of Hanjin Shipping Co Ltd)  5 SLR 787, where the inherent jurisdiction of the court was invoked as a basis for recognition of foreign winding-up proceedings. In February 2017, the Court in Parakou Shipping Pte Ltd (in liquidation) v. Liu Cheng Chan  SGHC 15 confirmed that a director who procured a company to enter into undue preference transactions under Section 329 of the Companies Act read with Sections 99 and 100(1)(b) of the Bankruptcy Act could be in breach of his or her duties and that an order could be made against such a director personally to pay a sum equal in value to the undue preference transactions. In reaching its conclusion, the Court (per Chua Lee Ming J) affirmed the position that had been previously adopted by the Court (per Steven Chong J) in Living the Link Pte Ltd (in creditors’ voluntary liquidation) and others v. Tan Lay Tin Tina and Ors  3 SLR 621 and reiterated the importance of ensuring that the courts must be slow in allowing a liquidator to employ the claim against the director as a means of circumventing the strict statutory criteria for an undue preference laid down by Parliament in the Bankruptcy Act. Notably, the Court also observed that the mere fact that the transactions fell outside the statutory clawback period could not excuse the directors concerned from being held liable for breach of their duties. As stated above, in order to position Singapore to meet the anticipated increase in demand for insolvency and restructuring services in the Asia-Pacific region, the DRC was appointed by the Ministry of Law in May 2015 to build on the work of the ILRC and recommend initiatives and legal reforms to cement Singapore’s status as a leading centre from which to coordinate a multi-jurisdictional restructuring. Key recommendations by the DRC in its 20 April 2016 report have been implemented through the most recent round of amendments to the Companies Act, which came into operation on 23 May 2017. 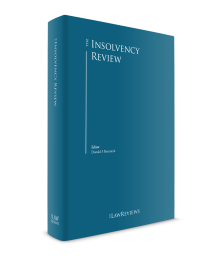 Notably, several of the key changes to the existing insolvency framework were adapted, with appropriate modification, from jurisdictions that possess more mature and highly developed insolvency processes. In light of the current economic climate, it is anticipated that more companies (including foreign companies) will avail themselves of the new features under the enhanced insolvency regime. 1 Nish Shetty is a partner, and Elan Krishna and Keith Han are associates, at Clifford Chance Asia. 2 Section 247, Companies Act. 3 Section 297(1), Companies Act. 4 Section 294(1), Companies Act. 5 Section 267, Companies Act. 6 Section 267, Companies Act. 7 Section 269, Companies Act. 8 Section 227A, Companies Act. 9 Section 227B, Companies Act. 10 Section 227G, Companies Act. 11 Section 227D, Companies Act. 12 Section 4(10), Civil Law Act. 13 Section 210, Companies Act. 14 Section 210(3AB), Companies Act. 15 Sections 211H(2) and 211H(3), Companies Act. 16 Section 211H(4)(a), Companies Act. 17 Section 254(1)(e), Companies Act. 18 Section 254 (2)(a), Companies Act. 19 Section 254 (2)(b), Companies Act. 20 Section 253(1), Companies Act. 21 Section 255(2), Companies Act. 22 Section 258, Companies Act. 23 Sections 296 to 298, Companies Act. 24 The statutory declaration is made by the company’s directors. 25 Section 293, Companies Act. 26 Section 255(1), Companies Act. 27 Sections 293(1) and 293(3), Companies Act. 28 Section 293(2), Companies Act. 29 Section 294(1), Companies Act. 30 Section 295, Companies Act. 31 Section 227A, Companies Act. 32 Section 227D(4), Companies Act. 33 Section 227B(5), Companies Act. 34 Section 227C, Companies Act. 35 Order 30, Rule 2, Singapore Rules of Court. 36 Sections 210(1) and 210(2), Companies Act. 37 Section 210(10), Companies Act. 38 Sections 211B(8) and 211B(13), Companies Act. 39 Section 211B(4), Companies Act. 40 Section 211B(4), Companies Act. 41 Section 211B(2)(b), Companies Act. 42 Sections 211B(10) , 211B(11), and 211B(4), Companies Act. 43 Section 211C(1), Companies Act. 44 Section 211B(5), Companies Act. 45 Section 272(1)(a), Companies Act. 46 Sections 294(2) and 297(4), Companies Act. 47 Section 265(1), Companies Act. 48 Section 275, Companies Act. 49 Section 227G(2), Companies Act. 50 Section 227J, Companies Act. 51 Section 227M, Companies Act. 52 Section 227N, Companies Act. 53 Section 227I, Companies Act. 54 Section 218(3), Companies Act. 55 Section 227(2), Companies Act. 56 Sections 211E(9) and 227HA(10), Companies Act. 57 Sections 211E(1) and 227HA(1), Companies Act. 58 Insolvency and Public Trustee’s Office at https://www.mlaw.gov.sg/content/dam/minlaw/io/Statistic/Companies%20Liquidation.pdf.